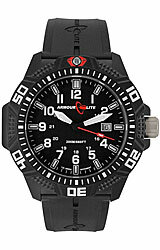 The AL613 is a brand new addition to the Caliber Series from Armourlite. The AL613 features a the new Rubber Band made out of Nitrile Butadiene Rubber. All Caliber Series Watches share a 47mm case and genunine sapphire crystal, assuring this Armourlite Series continues to provide the best value for money of any Tritium watch. The AL613 has white hands and numerals with red accents and features a lightweight polycarbon case, one-way rotating ratcheting bezel, virtually scratch proof sapphire crystal, 200 meter water resistance and full tritium illumination on all hands, even the second hand.